UK toy retailers are holding out for a busy Christmas after sales fell by 2% in the first nine months of the year.Analysts and retailers expect a flat full year at best for the industry following two consecutive years of rapid growth.Spending on toys totals Cheaper collectables feature prominently on the list, alongside more traditional games and film and TV tie-ups. Gender specific toys: do you stereotype children? Frederique Tutt, global industry analyst for the NPD Group's toy division, said that sales had been "sluggish" in the year so far, whereas activity had risen in the other major toy markets in Europe, the US and Russia.She pointed to a correction following two years of 7% growth in the UK, which had outstripped other markets and had been driven in part by the success of the Star Wars franchise. 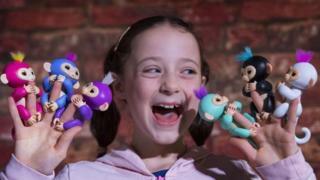 Seven of the 10 best-selling toys of the year so far have had a price tag of less than ?10, she said. Alan Simpson, chairman of the Toy Retailers' Association, which compiles the Dream Toys list, said the weakness of the pound had pushed up prices in the UK as most toys were imported. The toy market was suffering from the income squeeze of customers as much as other sectors, he added. "However, the rule book gets thrown away at Christmas, no matter how tough things are [for parents]," he said. Ms Tutt said that this year's list of top toys was relatively low-tech, with traditional games playing a more "dynamic" part in the market. "Parents are saying that too much screen time is not good," she said.Only 1% of toys were "connected" via the internet, yet the influence of the web - and particularly social media - was clear from the design of new toys.One of the expected best-sellers at Christmas is the L.O.L. Surprise - a heavily wrapped toy inspired by "unboxing" videos on YouTube and other social media channels.Marketing for other toys had been launched on social media rather than TV adverts, she said. and manufacturers were counting on shared videos of youngsters playing with their new toys as another form of advertising.